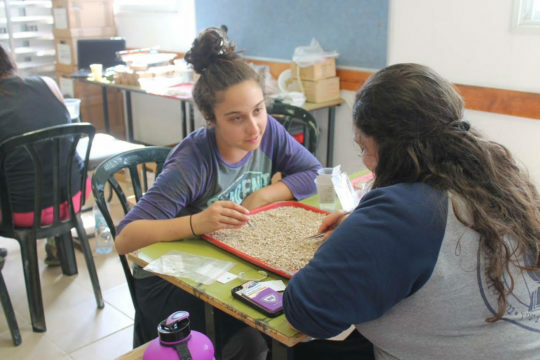 This summer, seven Yeshiva University students traveled to Israel for a summer course, to work with Dr. Jill Katz, clinical assistant professor of archaeology at Stern College for Women, on excavating the city of Gath. 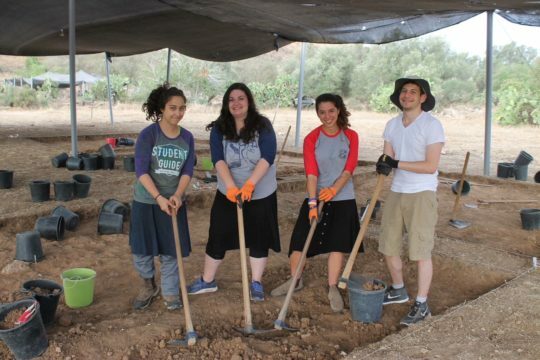 The dig was sponsored by a grant from the Leon Charney Legacy Fund of the Yeshiva University Center for Israel Studies. 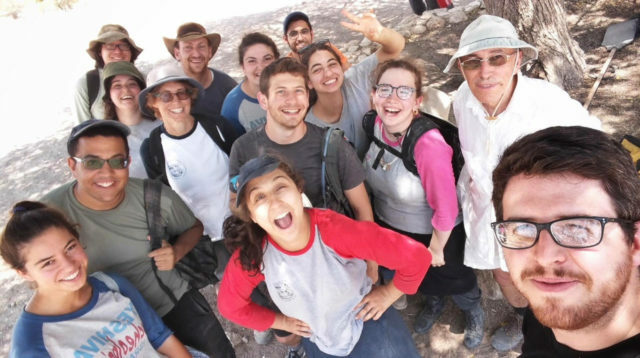 “The students gain a chance to be part of a large research team that is very serious about its research, yet in an environment that allows them to be full participants despite their inexperience,” said Dr. Katz. The students have just finished the dig for this year; some shared their thoughts about the experience. We wake up bright and early at 4:30 a.m., ready for a productive day of digging. When we reach the excavation site, just in time for sunrise, we organize our area and put up a tent for shade. We spend the next 7 to 8 hours digging in carefully measured squares, collecting pottery shards, bones and other interesting finds. We break up the hours of work at Tell es-Safi with a break for coffee, breakfast and fruit. In the afternoon, we head back to Kfar Menahem, the kibbutz where we’re staying, just in time for lunch. We spend the afternoon washing pottery and analyzing the previous days’ finds, and attend an evening lecture before dinner. The hot hours spent digging and resting together encourage our group to get to know one another in a completely new context, and I’ve been lucky to befriend some interesting and inspiring people. I feel so fortunate to play a part in excavating, uncovering, discovering and contemplating the mysteries of Tell es-Safi (referred to in Tanach as Gath, Goliath’s hometown). I find it mind-blowing that we, presumably limited to our society’s lifestyle and method of thought, can tap into other lifestyles and day-to-day traditions dating back thousands of years through the relics just beneath our feet. On one of our first days of digging, a fellow YU student from my team found a pipe from the time of the Ottoman Empire. I was intrigued by its intricate design and thought about how the remnants we uncover here are pieces of daily objects used exactly here, so long ago. I’m so grateful to be working on such an exciting project along with such interesting people and feel so lucky to contribute to uncovering these windows to ancient life. Between the fascinating people digging with me, the mysterious pottery shards we find, and the peaceful places where we’re staying and excavating, my experience has been truly extraordinary. This summer, I left the air-conditioned classroom for the scorching fields of Tell es-Safi /Gat, where learning takes place primarily through informal instruction and imitation. Students learn the nitty-gritty of archaeology day in and day out, and I’ve personally come to appreciate the precision that goes into the archaeological dig, from taking heights of the squares, making sure we are aligned with the official Israeli GPS grid system and identifying the exact location of every major find. 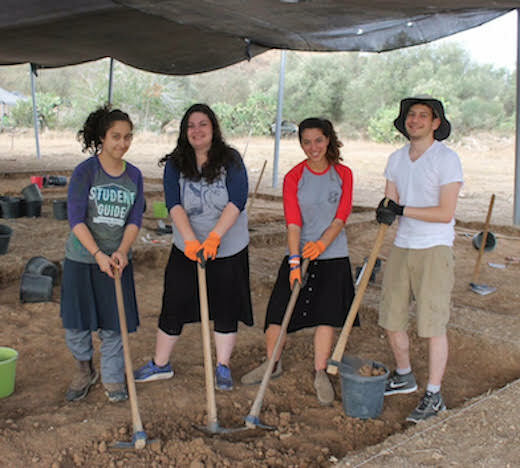 On the dig, we are constantly learning from our professors, which of course includes Dr. Jill Katz of Yeshiva University, but also Dr. Aren Maier of Bar-Ilan University, the director of the dig, Dr. Jeff Chadwick of Brigham Young University, and PhD students working with us. 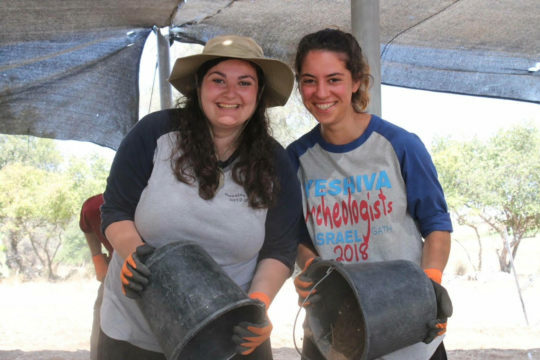 Our vibrant “archaeology beit midrash” includes an ongoing conversation from many different perspectives and ranges of expertise such that students can be found during meals or pottery washing sessions having discussions about methods of pottery dating, chemical soil analysis and dating of biblical events based on archaeological findings. The informal nature of the interactions with professors allowed me to have a continuous learning mindset and the opportunity to ask questions about each phase of the dig. At 6:00 a.m., I drag a pickax through the dirt on my right side, standing in a corner of an already two-foot-deep square of earth. I take my first swing of the day right then and there, still half asleep. It isn’t until about 10 minutes later, when I break a sweat, that I finally feel “broken in” to the day. It is then that I reinstate myself within the larger picture of the project going on around me. I become part of a whole again, consumed with the mission of my peers and supervisors. This mission isn’t only to understand the purpose of the structural remains in our area but to bring history to life on a physical level. When you’re holding history in your hand, the body is as involved as my mind. It’s holistic and satisfying. Part of the beauty of archaeology is that our narrative and the Philistine narrative grow together. Our culture affects our understanding of theirs, and we accept this and allow it to happen in a literal way, physically standing on top of them and hitting closer and closer while also changing ourselves. We imagine how to use the devices they once used partially by empathizing. In this way, we never fully separate ourselves from history. We are involved. When we involve ourselves in this holistic way that archaeology allows, the knowledge we accumulate is thrilling. At our site, a few questions about the architecture in our area led to many more questions as we dug deeper. As frustrating as this can be, the new questions were also more fascinating. We moved from “why was there fire here?” to “was it intentional?” to “is this a kiln for making mud bricks?” to “wow, this is Iron Age I, not II—what does that mean?” The number of new doors that knowledge can open is so unpredictable, large and exciting. It also gives us a humbling reality check that our understanding is so limited, and that we need to uncover as much of the truth as possible. We need to adapt as much as the Philistines probably did. The dig season just ended, but my thoughts are still swarming. Thank you to Dr. Steven Fine, director of The Center For Israel Studies, Dr. Jill Katz, and everyone else who made this experience possible. It has stretched my mind in ways I couldn’t have imagined previously.